Industry 4.0 or Production 4.0 is the current trend of automation and data exchange in manufacturing technologies. Industry 4.0 is an industrial evolution concept with four stages (see fig. 1). The term is mainly used in Europe, having its roots in Germany. There are, however, similar initiatives in many countries. In the US, it is called „Industrial Internet Consortium“ (IIC). The Industrial Internet Consortium was founded in March 2014 by the companies AT & T, Cisco, General Electric, IBM and Intel. New Internet technologies are to be jointly promoted, although the approach is not limited to the industrial sector. Further initiatives are in Japan under the name „Industrial Value-Chain Initiative“ (IVI). Initiators are major Japanese companies. China also took initiatives similar to the German political initiative “Industry 4.0” in the five-year plan of 2015. They are intended to play a decisive role in the shift from low-wage countries to global industrial power. South Korea also invests in so-called smart factories. In several European countries there are other activities comparable to the German political initiative “Industry 4.0”, such as France du „Industrie du futur“. Industry 4.0 has its basic focus on the production process within a „smart factory“, while the Internet of Things focuses on the utilization phase of digitalized and connected devices and products. 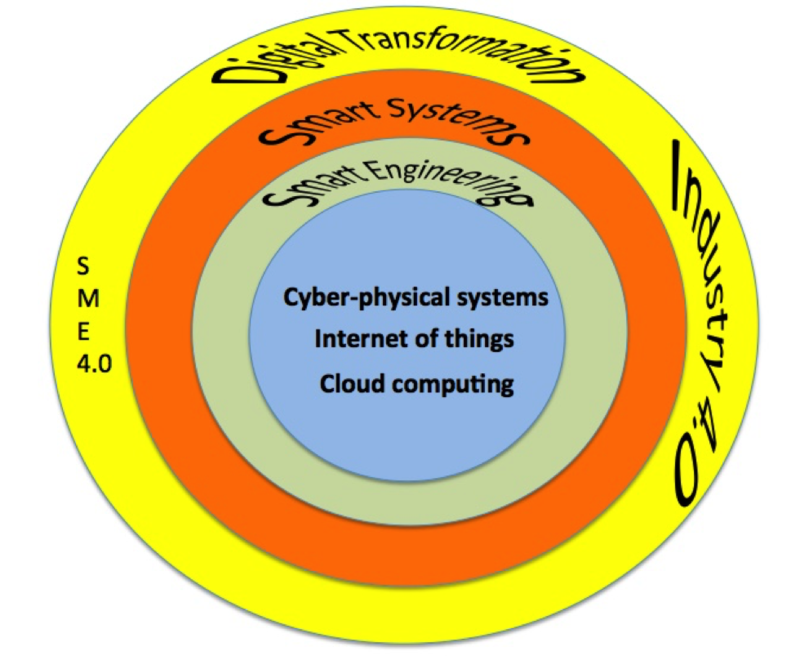 Industry 4.0 includes cyber-physical systems, the Internet of things (IoT) and cloud computing (Herrmann, Pentek und Otto 2016). The term “industry 4.0” focuses strongly on smart factories. In order to describe general digital transformation processes, resulting value chain changes and effects related to non-industrial small and medium enterprises (SME) we consider the term industry 4.0 as too constricted (see fig. 1). Industry 4.0 creates or resembles what has been called a „smart factory“ (Wikipedia, Industry 4.0 2017). A smart factory is a smart system that is based on smart engineering. The digital transformation shell model (see fig. 2) shows the relation of the different terms. Actuators that perform or trigger the required action. about their origin, destination, components, and use. And waste disposal could become a truly efficient individual recycling process (Wikipedia 2015). What is smart engineering? This term covers the methods, processes and IT tools for the cross-disciplinary, system-oriented development of innovative, intelligent and connected products, manufacturing facilities and infrastructures. These areas are currently also grouped together under the term Industry 4.0. This refers to the networking of, and comprehensive exchange of information between, all the components involved in the manufacturing process, and between all the individual part-processes of product development and manufacture, with the aim of achieving significant improvements in performance, cost, quality and customer acceptance of products. An important part of smart engineering is securing and testing an interdisciplinary lifecycle management process, as the various knowledge domains and interrelationships are currently not sufficiently connected, with the result that information can be lost and networked relationships have to be recaptured and re-implemented. For product development purposes, smart engineering applications come into play as early as the planning stage, because it is here that, within a diverse range of defining criteria, the developer first starts to create the product’s structure and associated information models. This digital development process ultimately benefits the qualifying and networking of production and the modelling of processes and automation technology. This must involve secure and reliable communication between not just the individual sub-processes but also the various components of the manufacturing facilities. A particular challenge here is communication with mobile elements. Ultimately, smart engineering is about the integration of product development, production planning and production management to ensure the rapid market-ready implementation of innovative product ideas and the creation of value via a digital development process. (Universität Duisburg 2017). In cyber-physical systems (CPS), physical and software components are deeply intertwined, each operating on different spatial and temporal scales, exhibiting multiple and distinct behavioural modalities, and interacting with each other in a myriad of ways that change with context (US National Science Foundation 2010). Examples of CPS include Industry 4.0 or SME 4.0 in general or smart grid, autonomous automobile systems, medical monitoring, process control systems, robotics systems, and automatic pilot avionics in particular. Often, CPS are seen as a pre-stage to IoT. They are sharing the same basic architecture, nevertheless, CPS present a higher combination and coordination between physical and computational elements (Rad, et al. 2015). Common applications of CPS typically fall under sensor-based communication-enabled autonomous systems. For example, many wireless sensor networks monitor some aspect of the environment and relay the processed information to a central node (Karnouskos 2011). A challenge in the development of cyber-physical systems is the large differences in the design practice between the various engineering disciplines involved, such as software and mechanical engineering (J .Fitzgerald 2014). The market researchers at IDC estimate that in 2020 around 30 billion „things“ worldwide – such as machines, cars, washing machines and fridges – will be connected via the Internet. In Germany alone, there will allegedly be six connected devices per inhabitant in 2017. Parallel to this development, a genuine explosion in data volumes is taking place: the data volume on the Internet doubles every two years. By 2020, mobile data traffic will be 150 times the size it was in 2010 (Telekom 2017). The technological complement to a sensor is an actuator, a device that converts an electrical signal into action, often by converting the signal to nonelectrical energy, such as motion. A simple example of an actuator is an electric motor that converts electrical energy into mechanical energy. Actuators may be stand-alone (i.e. just an output device), or may be combined with an IoT input sensor. An example might be an intelligent light bulb designed for night lighting outdoors – where the sensor detects that the ambient light has fallen to a predetermined level (that may be externally programmable), and in addition to reporting this data upstream also directly triggers the actuator (the light bulb itself) to turn on. In many cases an actuator, in addition to acting on data sent to it over an IoT network, will report back with additional data as well, so in some sense may contain both a sensor as well as an actuator. An example, again using a light bulb: the light bulb turns on only when specifically instructed by external data, but if the light element fails, the bulb will inform the network that this device is no longer capable of producing light – even though it’s receiving data. A robustly designed network would also require the use of light bulb actuators that issue an occasional ‘heartbeat’ so if the bulb unit fails completely, the network will know this and report the failure (Parasam 2016). Requirement of low energy consumption. Bluetooth low energy (BLE) – Specification providing a low power variant to classic Bluetooth with a comparable communication range. Near-field communication (NFC) – Communication protocols enabling two electronic devices to communicate within a short range. Radio-frequency identification (RFID) – Technology using electromagnetic fields to read data stored in tags embedded in other items, also for identification. GSM, 3G, LTE, 4G …..
Current technologies for identification of location are GPS, triangulation or ultrasound for room inside of buildings. Memory technologies depend on actual hardware implementation. IoT refers to networking objects with the Internet so that these can communicate independently over the Internet and carry out various tasks for the owner. The most important evolutionary step in implementing the vision of the Internet of Things took place in 2012 when the leading Internet groups switched to the Internet Protocol Version 6. This hugely increased the number of available IP addresses: whereas before 4.3 billion addresses had almost entirely been used up, there are now 340 sextillion free addresses available. Furthermore, web addresses could previously only be issued to computers, smartphones, and other devices – now every container, every pallet and, even every individual garment can get its own IP. 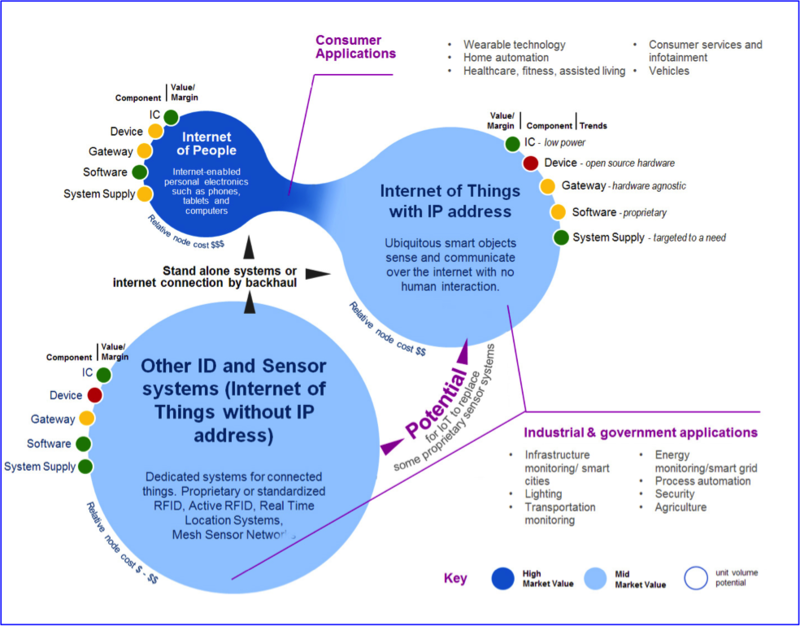 The IoT-map (fig. 2a) below provides a interesting view on different application areas for IoT-system with and without allocated IP-addresses. The map makes a difference between IP-based -system und such systems based on non-IP-protocols. Systems based on non-IP-protocols are for instance RFID or Meshes. Actually, from the computer science point of view there is no Internet. But for this report, such system shall belong to the class of IoT applications. On the other hand side we have IP-based systems – part of the Internet. This particular figure focuses on systems of smart objects and systems of machines attached to people – the Internet of people. The non-scientific term “Internet of people” (IoPTS) describes the vision where people, things (physical objects) and services are seamlessly integrated into the networks of networks as active participants that exchange data about themselves and their perceived surrounding environments over a web-based infrastructure. The IoPTS, amongst many other aspects, is characterized by: its massivity in terms of people, services, and things, that will generate information populating massive databases; its advanced capability for tracking people, objects and things; its focus is on multiple frontiers, a person can assume multiple identities where each identity is associated with multiple things (devices) connected to multiple services; its vertical mobility with a phenomenal increase in the level of complexity from a governance point of view (Eloff, et al. 2009). In the given context the term “smart objects and systems” refers to the fig. 2 related explanations. Consumer applications are located in-between IoPTS and smart systems. 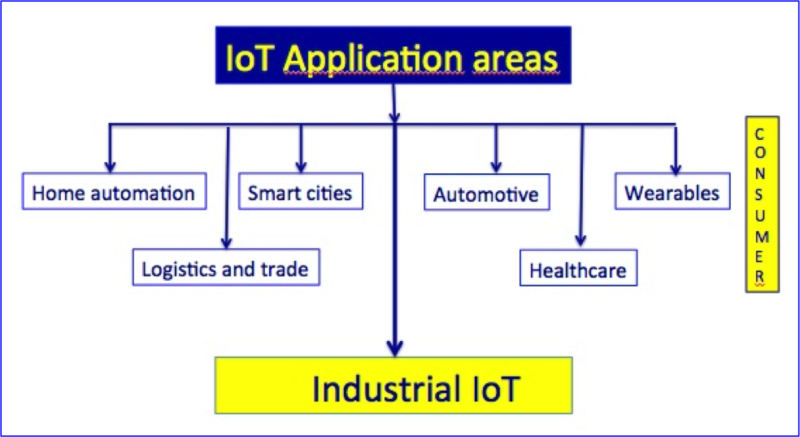 There are several options to classify IoT application areas. E.g. a technical classification or a function based classification would be possible. In order to address special SME requirements, for this report we have chosen a market oriented classification. We have identified a number of key markets for the IoT with potential for exponential growth (see fig. 3). Below we have listed characteristic applications and products that belong to the above IoT Key markets (Texas Instruments 2017). enhancing security, reduction of energy and maintenance costs, monitoring and control of intelligent buildings and smart homes. Reduction of cost & resource consumption for outdoor lighting, traffic management, water distribution, waste management, environmental monitoring, surveillance, long range wireless connectivity, centralized & integrated system control. Smart sensor bank: array of standard sensors mounted on light poles that detect location (GPS), air quality, proximity to detect traffic/pedestrian movement, light level monitoring, moisture, temperature and more. Typical functions: capture health data, Hospitals keep tabs on the location of medical devices, personnel and patients. Above fig. 3a provides an impressive image of the traffic increase of M2M connections resulting from the IoT utilization, here in an international provider network. The Industrial Internet of Things is defined by the Industrial Internet Consortium as ‘machines, computers and people enabling intelligent industrial operations using advanced data analytics for transformational business outcomes” (Industrial Internet consorium 2017). different technological areas involved with the IIOT. It’s important to know that the Industrial Internet of Things is not just about saving costs and optimizing efficiency though. Companies also have the possibility to realize important transformations and can find new opportunities, e.g. entirely new business models in Industry 4.0 (i-SCOOP 2016). (Vogt, et al. 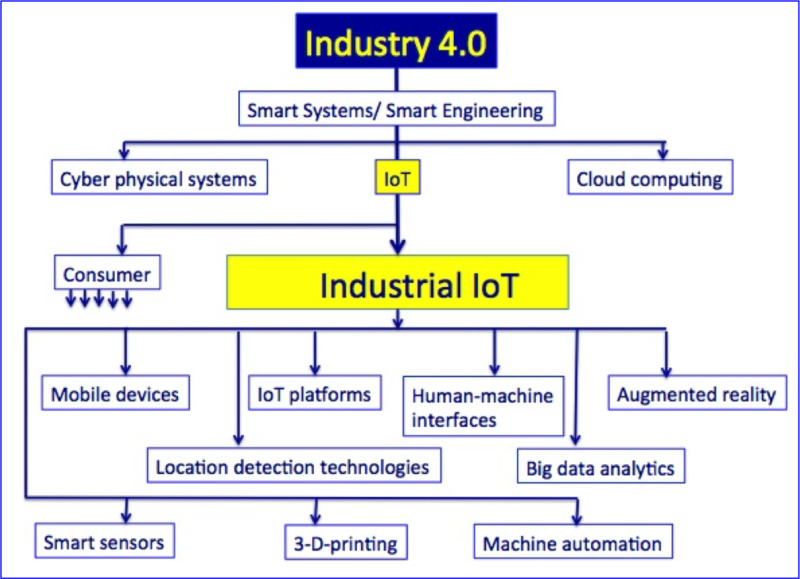 2016) proposes a slightly different value-chain focused view: Both, Industry 4.0 and IoT, examine the possibilities arising through increasing connectedness on various levels – from the device and machine level, to the machine park level (in production) or device groups (customers‘ use) to connected machines and products on a business process level(see fig 5). The term IIOT is often used in the context of Industry 4.0 / SME 4.0, which is the term that describes a new industrial revolution with a focus on automation, innovation and data (see fig. 4). On top of IIoT, Industry 4.0 also is about other technologies; which are related with it. Examples include robotics, cloud computing but also the evolutions in operational technology (OT). It involves specialised technologies for data analyses. (see also next chapter). Smart factory applications and smart warehousing. Smart maintenance and equipment management. Using sensors in vital components enables users to retrieve information on the condition of wind turbines during operation and process it in real time in a solution of Schaeffler. It is planned to use wind turbines to explore how machine learning can reveal additional insights about the performance of equipment in different operating conditions. Sensors in the equipment and in the bearings themselves will report on the condition of components in real-time. Using wind forecasts algorithms, turbine operators will be able to plan ahead and replace parts during less windy periods. Using cognitive insights from the cloud, this particular solution (Laros 2016) is aiming to enhance its predictive maintenance systems for railways, helping to improve efficiency and safety. Smart bearings will be able to measure their own vibration, temperature, torque and speed triggering alerts and informing railway operators about possible safety issues. The connected Industry 4.0 will allow for the monitoring of thousands of machines and pieces of equipment on and off site. Data can be transmitted to an operation centre and processed in the cloud. Algorithms and cognitive approaches can analyse that data to make predictions about machine performance and create opportunities for optimization. Irregularities and potential faults can be automatically identified and corresponding actions rapidly initiated. „This is an era of unprecedented industrial transformation defined by factories, machines and parts capable of self-assessing, triggering actions and exchanging information with each other, and with the people who manufacture and maintain them,“ said Harriet Green of IBM Watson IoT (Laros 2016). It is important to not only collect data from machines, sensors, ERP systems, manufacturing execution systems (MES) and other sources, but to also ensure a detailed analysis of these data. Data collection is done via adapters (also called connectors, agents etc.). Typically, these adapters transmit machine-readable data into traditional systems such as databases or databases that are integrated with an ERP system or MES to conduct various analysis of these data, which today often must be prepared manually by specialists. Very advanced solutions are able to process certain data without intermediate processing steps. Baldwin, C. Computer Weekly. 21 05 2014. http://www.computerweekly.com/news/2240221071/Germany-leads-the-internet-of-things-says-Cisco (accessed 02 15, 2017). Beckhoff Automation. Newe Automation Technology. 2017. https://www.beckhoff.de (accessed 02 14, 2017). Bosch. The Bosch IoT Suite services. 2017. https://www.bosch-si.com/products/bosch-iot-suite/paas/iot-services.html?ref=in (accessed 02 15, 2017). Chitkara, R., W. Ballhaus, and O. Acker. “The Internet of Things: The next growth engine for the semiconductor industry.” PWC. 2015. https://www.pwc.ie/media-centre/assets/publications/2015-pwc-iot-semicon-paper.pdf (accessed 02 19, 2017). Columbus, L. “2016 Internet Of Things (IOT), Big Data & Business Intelligence Update.” Forbes. 02 10 2016. http://www.forbes.com/sites/louiscolumbus/2016/10/02/2016-internet-of-things-iot-big-data-business-intelligence-update/#2db1646525aa (accessed 92 19, 2017). Eloff, I., M. Eloff, M. Dlamini, and M. Zielinski. “Internet of People, Things and Services – The Convergence of Security, Trust and Privacy.” Researchspace. 2009. http://researchspace.csir.co.za/dspace/bitstream/10204/4409/1/Eloff_2009.pdf (accessed 02 17, 2017). eMarketer. Europe’s Marketers See Challenges Shift as Technology Advances Digital platforms are transforming the marketer’s role – See more at: https://www.emarketer.com/Article/Europes-Marketers-See-Challenges-Shift-Technology-Advances/1012672?ecid=MX1086#sthash.rCPymazV.dpuf. 01 07 2015a. (accessed 02 19, 2017). —. Internet of Things Has Big Awareness Gap in Germany. 28 08 2015b. https://www.emarketer.com/Article/Internet-of-Things-Has-Big-Awareness-Gap-Germany/1012919 (accessed 02 19, 2017). eprofessional. 2016. http://www.eprofessional.de/en/ (accessed 02 15, 2017). European Commission. Digital Single Market. 28 04 2015. https://ec.europa.eu/digital-single-market/en/news/ecall-all-new-cars-april-2018 (accessed 02 15, 2017). Forcam UK. Internet of Things set to Revolutionise Manufacturing. 22 07 2014. http://www.ainsmag.co.uk/client-news/forcam-uk/internet-of-things-set-to-revolutionise-manufacturing/ (accessed 02 14, 2017). Gartner. “The Platform Architect’s Guide to Designing IoT Solutions.” 20 10 2015. https://www.gartner.com/doc/3153929?srcId=1-7408113762&stl=0 (accessed 02 19, 2017). Genter, A. Warten auf das “Next Big Thing” Deloitte Global Mobile Consumer Survey. Studie, Stuttgart: Deloitte Consulting GmbH, 2016. Herrmann, N., T. Pentek, and B. Otto. “Design Principles for Industrie 4.0 Scenarios.” System Sciences (HICSS), 2016 49th Hawaii International Conference on, 2016. IDTechEX. Internet of Things applocations Europe 2017. 2017. http://www.idtechex.com/internet-of-things-europe/show/en/ (accessed 02 16, 2107). Industrial Internet consorium. Industrial Internet consorium. 2017. http://www.iiconsortium.org/index.htm (accessed 02 09, 2017). Indyk, P. “Tutorial on Compressed Sensing.” MIT. 2017. https://people.csail.mit.edu/indyk/princeton.pdf (accessed 02 19, 2017). i-SCOOP. Internet of Things – IoT guide with definitions, examples, trends and use cases. 2016. https://www.i-scoop.eu/internet-of-things-guide/#The_flavors_of_IoT_the_Industrial_Internet_of_Things (accessed 02 09, 2017). ITU. Internet of Things Global Standards Initiative. 2017. http://www.itu.int/en/ITU-T/gsi/iot/Pages/default.aspx (accessed 02 05, 2017). J .Fitzgerald, P.G. Larsen, M. Verhoef. Collaborative Design for Embedded Systems: Co-modelling and Co-simulation. Heidelberg: Springer, 2014. Karnouskos, S. “Cyber-Physical Systems in the Smart Grid.” Edited by IEEE. Industrial Informatics (INDIN). 2011. Laros, S. 5 Examples of How the Industrial Internet of Things is Changing Manufacturing . 06 10 2016. http://www.engineering.com/AdvancedManufacturing/ArticleID/13321/5-Examples-of-How-the-Industrial-Internet-of-Things-is-Changing-Manufacturing.aspx (accessed 02 20, 2017). Mc Kinsey. THE INTERNET OF THINGS: MAPPING THE VALUE BEYOND THE HYPE. 2015. https://www.mckinsey.de/files/unlocking_the_potential_of_the_internet_of_things_full_report.pdf (accessed 02 18, 2017). Parasam. IoT (Internet of Things): A Short Series of Observations: Sensors, Actuators & Infrastructure. 19 05 2016. https://parasam.me/2016/05/19/iot-internet-of-things-a-short-series-of-observations-pt-2-sensors-actuators-infrastructure/ (accessed 02 05, 2017). Rad, Ciprian-Radu, Olimpiu Hancu, Ioana-Alexandra Takacs, and Gheorghe Olteanu. “Smart Monitoring of Potato Crop: A Cyber-Physical System Architecture Model in the Field of Precision Agriculture.” Conference Agriculture for Life. 2015. 73-79. Schaeffler Germany. Industrial Wind Power. 2017. http://www.schaeffler.de/content.schaeffler.de/en/branches/industry/wind_power/index.jsp?windpower (accessed 02 09, 2017). Schulte, A. “Internet of Things in Deutschland 2015: Eine Anwenderbefragung.” IDC. 01 2015. http://idc.de/de/research/studien/internet-of-things-in-deutschland-2015-eine-anwenderbefragung (accessed 02 19, 2017). Statista. 2015. (accessed 02 15, 2017). —. Prediction of revenue from the Internet of Things in Germany from 2010 to 2020 (in billion euros). 2016. https://www.statista.com/statistics/669026/prediction-of-revenue-from-internet-of-things-in-germany/ (accessed 02 15, 2017). Stolpe, M. The Internet of Things: Opportunities and Challenges for Distributed Data Analysis. 2016. http://www.kdd.org/exploration_files/18-1-Article2.pdf (accessed 02 14, 2017). Telekom. 2017. https://www.telekom.com/en/company/details/digital-genius-363578 (accessed 02 16, 2017). Texas Instruments. Application areas for the Internet of Things. 2017. http://www.ti.com/ww/en/internet_of_things/iot-applications.html (accessed 02 06, 2017). Universität Duisburg. Smart Engineering. 06 01 2017. https://www.uni-due.de/iw/en/research/psp3.php (accessed 02 04, 2017). US National Science Foundation. Cyber-Physical Systems (CPS). 11 03 2010. https://www.nsf.gov/pubs/2010/nsf10515/nsf10515.htm (accessed 02 06, 2017). Verizon. State of the Market: The Internet of Things 2015. 2015. http://www.verizonenterprise.com/ state-of-the-market-internet-of-things/ (accessed 02 14, 2017). Vogt, A., H., Dransfeld, Weiß, and Landrock,H. M. Industrie 4.0 / Internet of Things Vendor Benchmark 2016. Munich: Experton Group AG , 2016. Voigt, A. ndustry 4.0 and the IoT – market trends for the next years. 11 05 2016. http://blog.bosch-si.com/categories/manufacturing/2016/05/industry-4-0-and-the-iot-market-trends-for-the-next-years/ (accessed 02 19, 2017). Wikipedia. Industry 4.0. 28 01 2017. https://en.wikipedia.org/wiki/Industry_4.0 (accessed 02 02, 2017). —. Smart Systems. 05 01 2015. https://en.wikipedia.org/wiki/Smart_system (accessed 02 04, 2017).